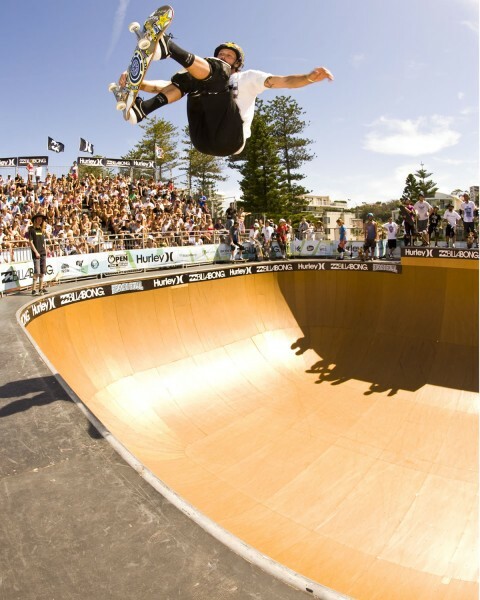 Today marked the 6th day of skateboarding practices at Manly Beach Bowl. And if the Beach Bowl continues to throw up the kind of action put on show by by Bob Burnquist and co today, the surfers are going to have a hard time keeping up. 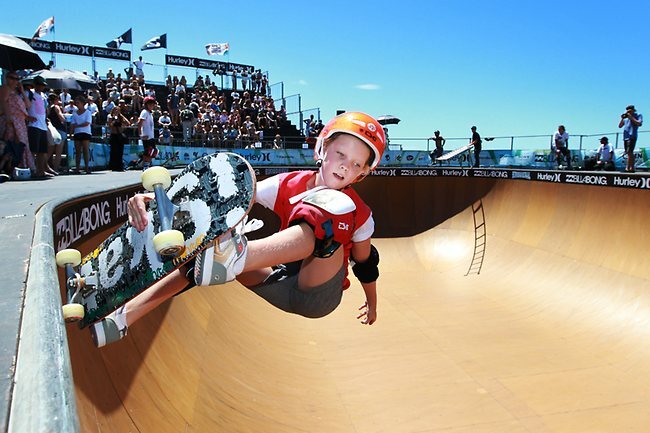 Burnquist, Bucky Lasek and a throng of the world's best skaters threw down some serious manoeuvres in even hotter heat at Manly's Australian Open of surfing, before the juniors took over an did their best to emulate. Eight-year-old Hurley rider Keegan Palmer has quickly established a cult fan basis, the jam-packed beachside stadiums echoing with chants of "Keegan, Keegan, Keegan". And the little shredder from Queensland didn't disappoint, carving the bowls and getting some serious air time in the junior comp. Photo Unknown, from Poppy's blog. But the starr of the day is definitively Bondi's Poppy Starr Olsen, the competition's only female skater. As one of the youngest, not to mention smallest, skaters in the competition, Poppy Olsen holds the title as the nation's best female bowl riding skater, beating out skaters three times her age for the title. She just landed #1 two weeks ago at the Australian Bowl championships in Newcastle and was qualified for both Manly Beach Bowl and Bowl-A-Rama Bondi (next week). At only 11 years old, she pulled off a 23 day tour of the US competing in the Gatorade Freeflow competition in both Tampa and San Diego and came in second overall. She spent a week at both Woodward East and Woodward West and an entire episode of FuelTV was devoted to the little grommets tour from Australia (in which there were 5 skaters in all and Poppy was the only girl). Thomas Olsen mummy lil' phenom said her little champ had a juggling act when it came to balancing school with skating: "It's hard with all her commitments but she's coping really well," Ms Olsen said. "We have set homework days and she knows if it's raining it's time to knuckle down and get the work done. ", didn't let the 12-foot bowl daunt her, leaving those in the stands in awe of the primary school student in front of a packed house.